If you work for one of the many Australian organisations which are starting to make use of geospatial open source, and you'd like to get skilled up in the technologies, then you will probably want to ask your boss to send you to one of LISAsoft's training courses. 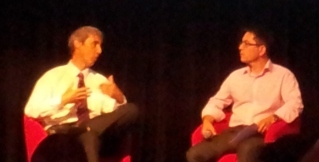 The recent GeoNext conference in Australia provided an interesting and very refreshing set of diverse presentations, covering the emerging technologies and businesses which are making use of geospatial. I answered interview questions around how to successfully build a business around Open Source, with a focus on Geospatial. James Moody, a futurist from CSIRO, boldly predicted that the next wave of innovation will address moving from a world of abundance to a world of scarcity, and the next big business opportunities will be based around improving efficiencies and recycling waste. It was disappointing to discover that the Australian http://data.gov.au initiative, which was looking very promising a year ago, doesn't have anyone driving it anymore. There were talks on augmented reality, cartography, geocaching, mobile gaming, building and marketing mobile applications, and some great lessons on building a startup company as 3 startups made a pitch to judges. Further on the business front, I was very impressed with a presentation from Mark Carniello. It is challenging for Australian companies to break into the US market, largely because a personal sales call to the US costs $10K worth of travel costs - and yet Mark explained how his Australian manned company is successfully selling a mission-critical system to electrical utilities in North America by setting up a virtual office, and leveraging phones and internet technology. This is certainly an event to look out for again next year.